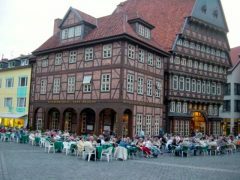 The Van Der Valk and Novotel are the best hotels in Hildesheim, Germany while top restaurants in restored half-timbered buildings line the historical Markt Market Square. Hildesheim, famous for its magnificent half-timbered buildings and UNESCO World Cultural Heritage listed Romanesque churches, has pleasant hotels and restaurants that invite travelers to linger longer. The best address in Hildesheim is the Hotel Van Der Valk Hildesheim (previously Le Méridien Hildesheim). It is a modern hotel behind the restored historical facades of three buildings facing Hildesheim’s magnificent Markt (Market Square). The hotel is very luxurious using ample wood in the public rooms. Bedrooms are very well equipped and comfortable. Rooms facing the square have a surcharge. The square is traffic free but especially on weekends, some noise is likely to drift in up to the late hours. The Van der Valk has a fitness center as well as a large indoor pool and other spa facilities. The Gildehaus (Guild House) restaurant serves upmarket international and local cuisine in the wood-paneled dining room or more pleasantly outdoor on the square if the weather allows. Rooms in the Van Der Valk tend to sell out fast. Prices range from around €120 to near €400 for double rooms. The Hotel Van Der Valk is directly on Markt (Market Square), less than a kilometer (half a mile) from Hildesheim Hauptbahnhof (Main Station). Hotel Van Der Valk, Markt 4, 31134 Hildesheim Germany, Tel 05121-3000. 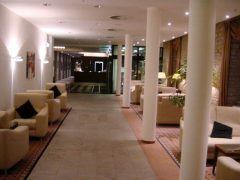 The Hotel Novotel Hildesheim (previously Dorint Sülte Hotel) is a very good alternative to the more luxurious Van Der Valk. It combines a listed historical building with a modern interior. The Novotel Hildesheim displays all the qualities that made hotels of the Dorint group prior to its acquisition by Accor Hotels so popular in Germany: understated elegance and excellent service. Rooms are very modern with straight, clean lines and all necessary facilities. The restaurants serves international and local cuisine in a rather sterile room – leisure travelers are more likely to head to the restaurants on Markt. Room prices range from well below €100 for early reservations on a quiet night to over €300. The hotel focuses on the business traveler, which allows for very good deals for leisure travelers on a slow weekend or holiday periods. The Novotel is quietly located around ten minutes stroll from the Markt and less than five minutes from the Hildesheim Hauptbahnhof (Main Station). Novotel Hildesheim, Bahnhofsallee 38, 31134 Hildesheim Germany, Tel 05121-17-170. Hildesheim has many restaurants but the average visitor is more likely to pick some place on Markt, the magnificently restored Market Square with impressive half-timbered buildings. The choice is vast, especially when the weather allows for outdoor seating. Musical entertainment is provided for free on many weekend nights. The Restaurant Gildehaus (Guild Hall) in the Van Der Valk Hotel is the best (and most expensive) choice on the Markt. It serves upmarket international and local cuisine either in its wood-paneled dining room or more pleasantly on the square. The Gaststube in Knochenhaueramthaus (Inn in the Butchers’ Guild Hall) is a very good choice for hearty local cuisine. The restaurant is spread over the lower four floors of the eight-story half-timbered house rebuilt true to the sixteenth-century original, which was destroyed in an air raid in 1945. It is often described as the most beautiful half-timbered building in the world. The various rooms have exposed beams allowing diners to observe the finer intricacies of medieval half-timbered building methods. The König von Bayern (King of Bavaria) allows for some Bavarian beer hall atmosphere and food in the cellars of the Gothic Rathaus – unfortunately closed due to work on the Rathaus and unlikely to reopen in the same format. Getting to Hildesheim is easy both by car and rail. 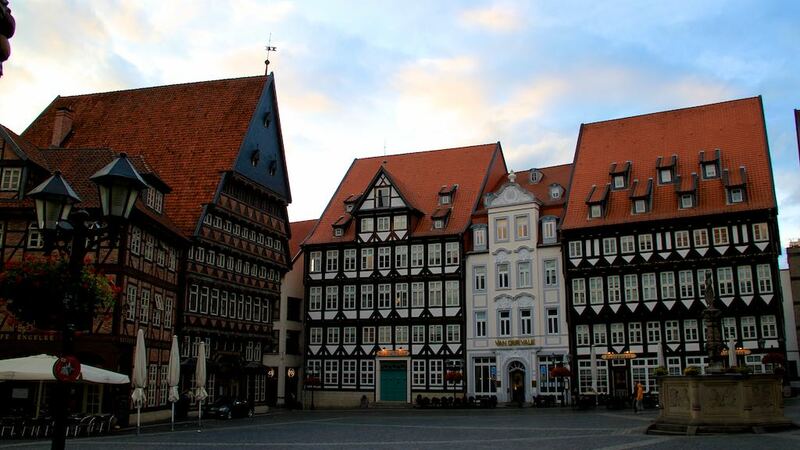 Hildesheim is just over 30 km (20 miles) south of Hannover – from the Autobahn A7 use exit 62 (Hildesheim). Hildesheim is a stop on the high-speed Inter-City-Express (ICE) railway network. Trains from Frankfurt am Main or from Berlin take around two hours from either city. Many more connections are available at Hannover, which can be reached on frequent local trains in between 23 and 36 minutes. Check German Railways for online timetable and print-at-home tickets. The closest airport to Hildesheim is Hannover Airport (HAJ), popular with low-cost airlines with many flights to European destinations. Intercontinental travelers are more likely to use Frankfurt International Airport followed by a train or car ride to get to Hildesheim. Roemer-Pelizaeus Museum with some of the best Egyptian Antiquities in the world.